As we count down the final hours of 2013 it only makes sense to review my year of drinking. Don't worry, what you find below isn't a list of my favorite beers, but rather a more broadly painted picture of my life as described through the pint glass. Before we get started on what I've been drinking I feel obliged to put in yet another plug for Untappd, the sole reason I have this data. I'm not going to lie and say I don't get giddy about earning badges but I also find real value in this well thought out app. I can't tell you how many times I've been this close to ordering a beer, only to take a couple more seconds to look it up on Untappd and find out I'd previously given it a horrible rating. Admittedly there have also been a few times when I've skipped that step and paid the price for it. Thankfully I'm learning and now it's almost an automatic part of my decision making. The results of my beer drinking shouldn't surprise anyone that has drunk with me or that has read a few of these posts. Four of my five Top Beers are IPAs or Imperial/Double IPAs, with the fifth being a very close cousin, the CDA. American IPAs and Imperial/Double IPAs are my two Top Styles and my Top Venue isn't my house (although it is second) but none other than my favorite watering hole The BeerMongers. I love trying new beers and the great part about doing that when surrounded by friends is that there is someone to share the joy (or pain) in what is found. I look forward to another year of trying more new beers, logging in both the good and the bad for future reference and enjoying the camaraderie of the craft beer world. Thank you to everyone that has shared a beer with me this year and thank you to Sean, Jim, Andrew, Matthew, Eric and anyone else who has beertended at Mongers for providing a welcoming place to enjoy a pint or four. I wish everyone a great start to 2014! I was recently gifted a sampler box of Portland Brewing beer containing two each of IPA, BlackWatch Cream Porter, MacTarnahan's Amber Ale and Royal Anne Cherry Stout. Earlier this year I had become reacquainted with the IPA and it has since become a go-to IPA for my fridge at home. With plenty of good hop flavor and a very reasonable price tag it's one I'm happy to find a chilled bottle of waiting for me anytime. It was Royal Anne however that really caught my eye upon spying it in the box, for two reasons. 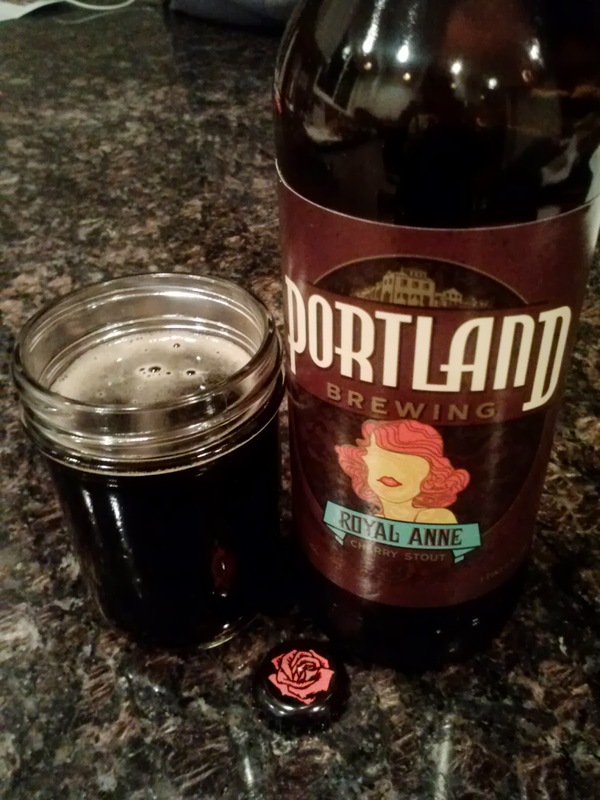 One is very superficial (my middle name is Anne) and one is very beery - how would this stout made with Oregon-grown cherries taste? Would the roasty coffee and chocolate notes overwhelm the fruit? Would the fruit flavor come off artificial tasting? With only one way to find out I cracked a bottle of it open. While I was pleased to find that there was no artificial cherry flavor I was also a bit disappointed that there was very little cherry flavor overall. There was definitely "something" in addition to the lingering, slightly chocolately flavor, but if I hadn't known it was cherry I'm not sure I would have been able to identify it. For a 7.8% stout it was nicely drinkable - not watery but not so heavy as to fill you up - yet I tend to enjoy fruit stouts where the fruit flavor is more prominent. Ambers are not a style I expect much from however MacTarnahan's is a perfectly fine representation of the style. One redeeming quality in a mild beer like this is that they can serve double duty - you can enjoy drinking them and they tend to work well in cooking applications. With this in mind I whipped up a batch of mini soufflé bites. I'd made the recipe once before, as directed using milk and was pleased with the results, but was confident there were infinite other variations just waiting to be tested out. This time I used a different kind of bread, changed up the cheese and did a straight substitution of beer for the milk that was called for. And you know what? They turned out great! The beer flavor isn't overpowering but it's there and along with the other changes really makes this recipe more of an appetizer than a breakfast item. It'll be one I'll continue to play with, especially when I'm looking for a nice "something to eat while drinking beer" appetizer. Finally I came to the porter, a style that is all over the board for me. This one I'm happy to say is the kind that is right up my alley - opaque black in color (blacker than many stouts), very roasty in back with just enough creaminess up front to keep me coming back for more. At a mere 5.3% this is a sessionable porter that roasty beer fans should check out. 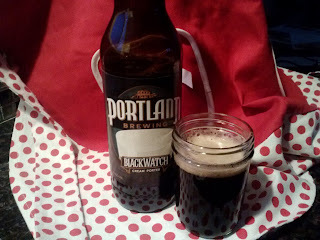 Thanks to Portland Brewing and Watershed for not only their generosity but for reminding me that it's a good idea to check back in with local staples from time to time. You never know when you'll be reminded of something you'd forgotten how much you enjoy. 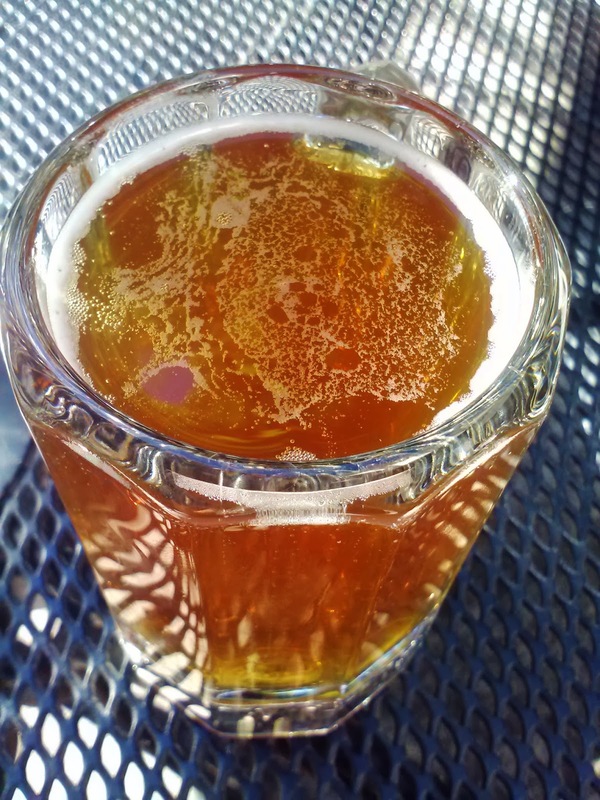 Would You Pay $24 for 32 Ounces of Beer? 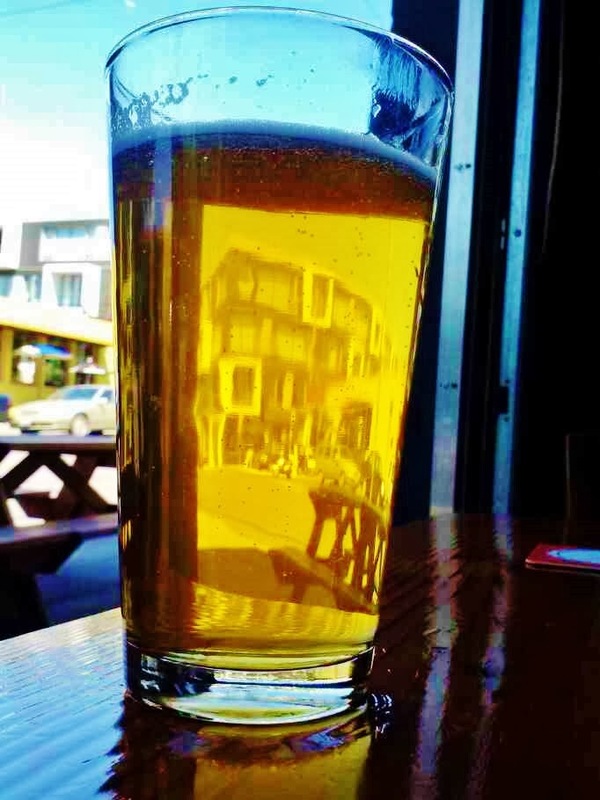 32 ounces of beer to go is often known around Portland as a grumbler or growlette, but whatever you call it, it's half of your standard 64-ounce growler. With that in mind your initial answer to that question might be, "hell no!" Without any context my reply would probably be something similar. Today my favorite watering hole is holding their Christmas Eve Eve celebration with an amazing 10-tap lineup, with a few more special kegs waiting in the wings. During the course of my Eve Eve drinking I overheard that the bar would be willing to fill grumblers for $24. That's in line with the special beer pricing for the event, $3 per 4 ounce pour. As good as many of these beers were I'm still not sure I'd pay that price for most of them. But there was one beer that I was severely tempted to lay down that kind of cash for. It's a 9+% barleywine from an East Coast brewery that does not distribute to this market. Besides being delicious, it's a rare find out this way and I'm not even sure what kind of favors had to be called in to get it. In that same vein was a posting from a Minnesota brewery last week that mentioned they had what I think is probably my favorite beer of all time, a 14% old ale, available once again. While I doubt they were offering it in anything other than a glass, a pint if you're lucky, you can bet that if I could buy a 32-ounce of grumbler of it for $24 I wouldn't give it a second thought. So what do you think? Is $24 for 32 ounces outrageous? Or are there beer(s) out there you'd be willing to fork out that kind of dough for (whether or not it would actually be possible)? Your Beer Smells Like What?!? 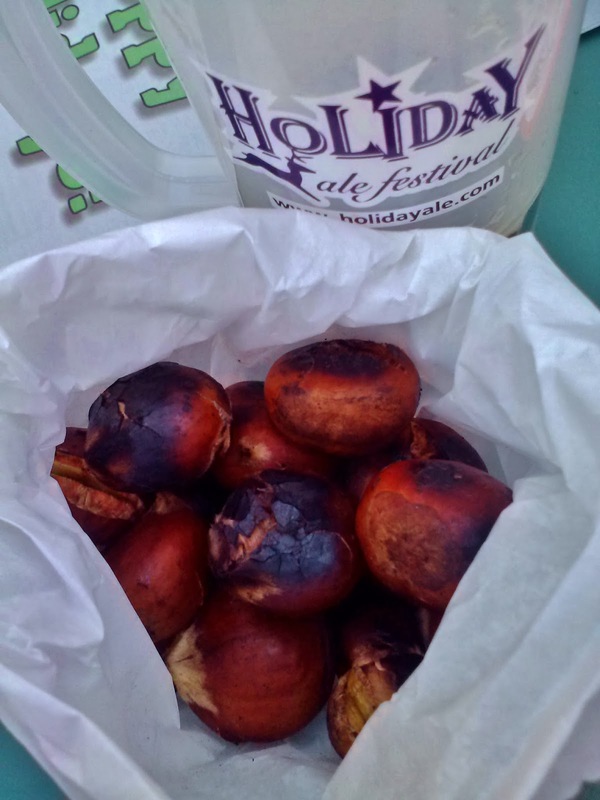 At a recent bottle share talk inevitably turned geeky as we discussed aromas in beer, particularly those aromas that in name might be construed as off-putting or a criticism of the brew. Among those are horse blanket, barnyard/hay and manure, B.O. (body odor) and cat piss (catty or cat urine for the more delicate crowd). For someone who hasn't noticed these aromas or has smelled "something" but couldn't quite identify it, a fair reaction would be for them to wonder why on earth someone would want to drink a beer with such an aroma. 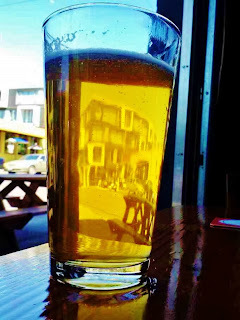 I recall the first time I smelled something odd but realized that I also loved the beer. It was a firkin of Summit Oatmeal Stout at Firkin Fest 2008 and there was a distinct cheese aroma. Right away we started referring to it as "The Cheese Beer" and I kept going back for more. Since then I've learned that I enjoy hay and manure aromas, that some of the most delightful IPAs have an impossible-to-ignore stanky B.O. aroma and that yes, even a cat piss aroma is something that won't turn me off from a beer. Do you have a favorite "stink" that makes you smile when you lift your glass and inhale it? 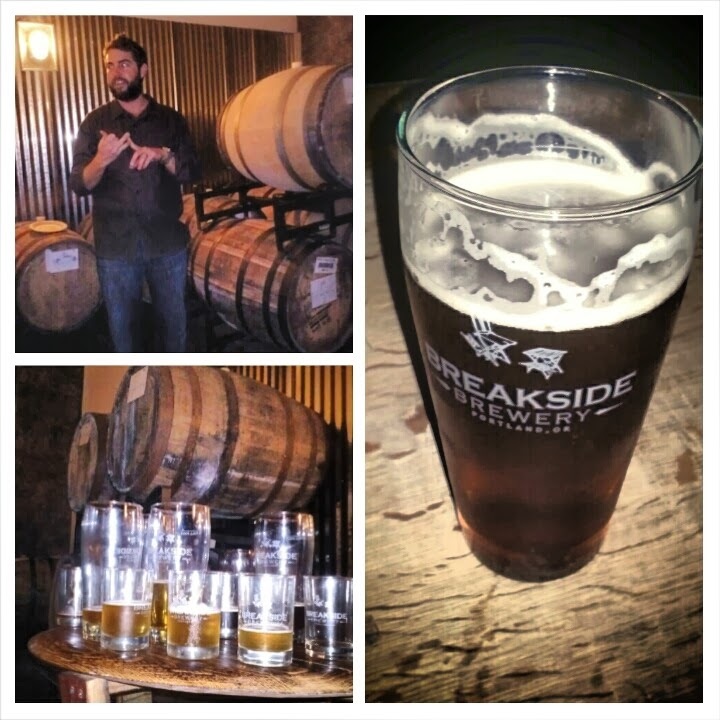 Last night's media event at Breakside's Milwaukie Brewery offered a sneak peak at some of the beers that will be available at their December 21st holiday limited-edition bottle release. This was my third or fourth visit to the location although for others this was the first time they had ventured into the depths of the Milwaukie office park where Breakside opened their production brewery January 2013. At the opening of the facility Breakside announced that it was their goal to brew 100 beers during their first year. That's no small feat but they've achieved it and in the process turned out some great sour beers as well as some very unique beers. Not all the beers have hit it out of the park for me but the vast majority of the beers this seven person team of brewers is turning out are excellent. For those that haven't visited yet it's worth the trek to Milwaukie, however I would recommend doing it on a Saturday or showing up early during the week (they open at 3 pm) to avoid spending quality drinking time stuck in traffic. With over 20 taps, many which you won't find elsewhere, not even at their original location, and one of the brewers always on beertender duty, it's a place to settle in and enjoy all they have to offer. Perhaps you'll want to do just that next Saturday, December 21st when they'll have a barrel-aged braggot, a triple IPA (their beer #100) and a barrel-aged blended beer, along with other special beers to tap for a day-long celebration. That's also the first day that their Cellar Reserve Club memberships go on sale. Limited to 80 members and offering exclusive access to certain beers this might be just the thing to please the ultimate beer geek on your list. They alluded to this event earlier in the week so make sure to follow them on Twitter or Facebook for updates and additional details. 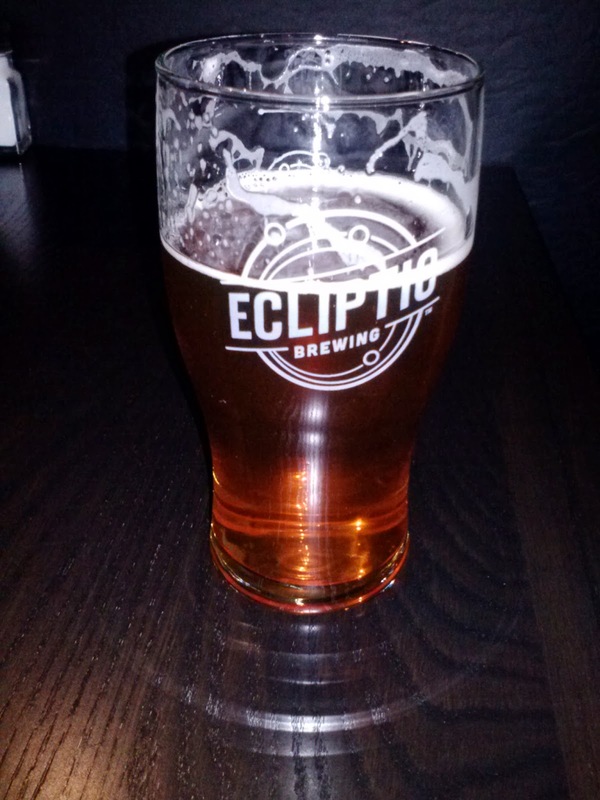 Ecliptic Brewing, the new venture of long-time Portland brewing icon John Harris, opened its doors at the end of October. It wasn't until the start of December that I finally made my way there to check things out. The space, tucked out of sight but just a stone's throw from the south end of happening N Mississippi, is a large one. Walking into the restaurant area one is likely to forget that they've shown up for beer, having instead arrived at a beautifully designed eatery. Thankfully both the beer and the food are worth showing up for. 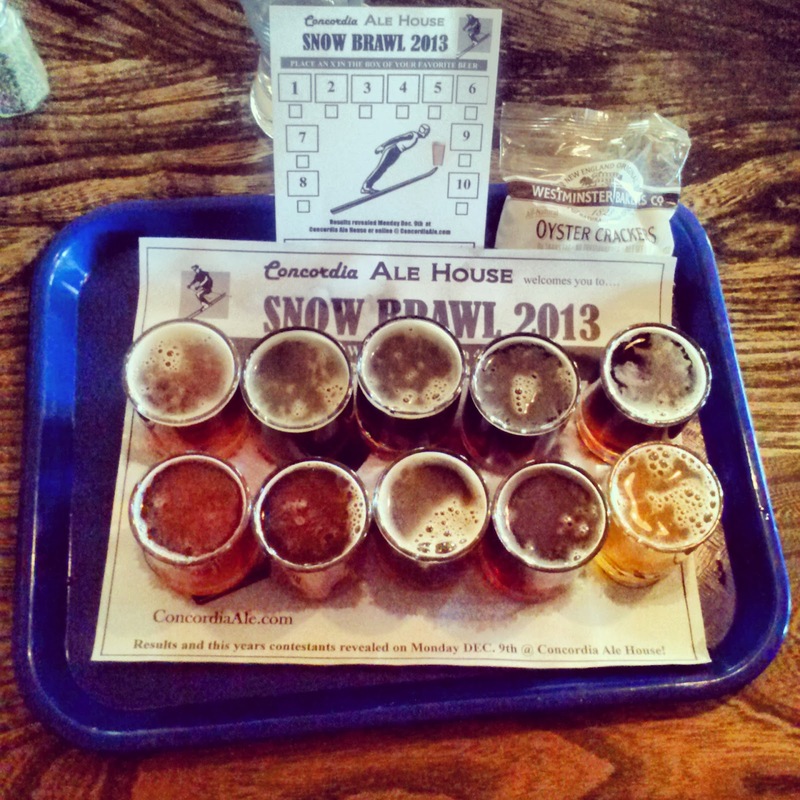 When we visited they had five of their own brews available in addition to a couple of guest taps and bottles. Figuring between the two of us we would have no problem trying all five we started off with the two most likely subjects - Procyon Pale and Arcturus IPA. What was unlikely is that not only did the both of us far prefer the pale to the IPA but in subsequent conversations with others that has been the unanimous opinion. Neither the Riegel nor the Spica were styles I'd generally order but they'll likely be enjoyed by others. 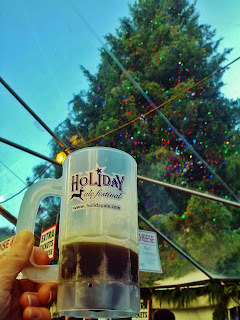 The Capella Porter was delightfully roasty without being heavy. 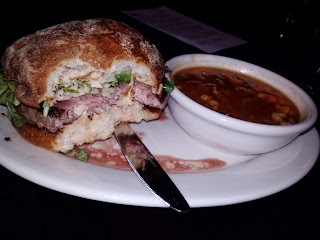 As for the food, the menu is compact and while a $13 burger might turn some off it instantly became my new favorite burger in town. Served medium-rare (without even having to request it) it can be had during happy hour for a very fair price of $10. I've heard some good buzz about their lamb burger as well so if I can resist the temptation to order the same thing on my next visit I'll be giving it a try. In the meantime I'm looking forward to trying out Filament, their Winter IPA that was released in bottles earlier this week. 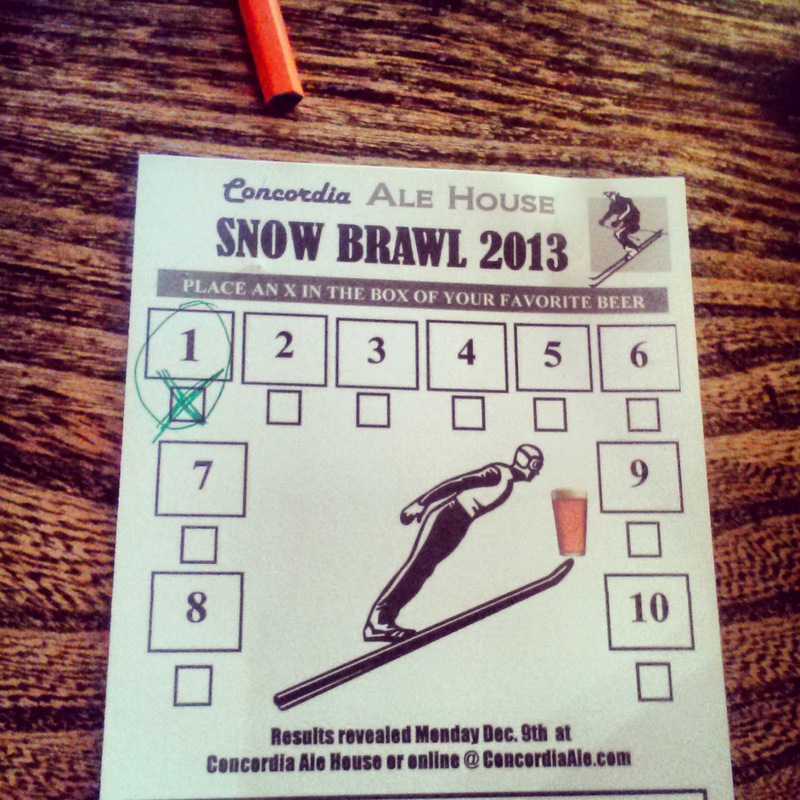 With the Holiday Ale Festival going on concurrently I'll take a wild guess and say that this Brawl at Concordia Ale House is getting a lot less love than most of them. However after visiting HAF twice early in its run and being asked by a buddy to join him at Concordia yesterday I found no reason not to do just that. 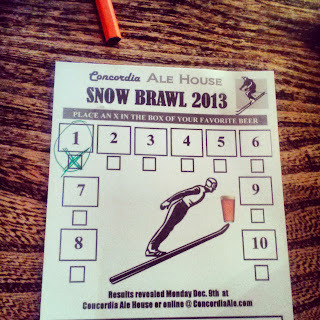 For those unfamiliar with Concordia's Brawls, they are basically blind beer tastings where each tray has 10 - 12 beers and people vote for their favorite. Sometimes the beers are all one style (i.e. IPAs), sometimes the beers are specifically from physical locations (i.e. half from Oregon, half from Washington) and sometimes there is a combination of things going on. Snow Brawl, unsurprisingly, was a tray of winter beers - 10 beers representing breweries in Oregon, Washington, California and Colorado. 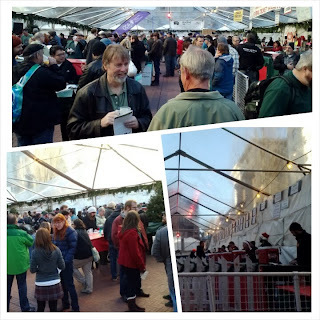 Overall I was unimpressed with the majority of the beers, which is a departure from most Brawls I've been to. However winter beers tend to go lighter on the hops than I'd like so there is a good chance that's the reason. That's also the reason that I chose #1 as my favorite. It was the hoppiest of the bunch and I unabashedly chose it. Concordia is great about getting the results out, usually in the wee hours separating Sunday from Monday, and I'll be even more interested than usual to have the beer and brewery names revealed. If you haven't stopped in yet you still have all day today. As a bonus, breakfast will be available until 2:00 p.m. and football will be on the TVs. Yesterday kicked off the 18th Annual Holiday Ale Festival at Pioneer Courthouse Square. It was an appropriately chilly day but between the bright sunshine and the heaters, it was cozy inside the tent. I came armed with my trusty cheat sheet of beers I wanted to try and determined to drink them in the pre-thought out order that roughly started with the lowest alcohol, most mild tasting beers. Right away my resolve was put to the test as I was told by multiple people that the High West Whiskey barrel aged Cappuccino Stout from Lagunitas was amazing. It was one of the highest alcohol beers at 12% ABV and the one I had designated to be last on my list. As I started in I did take into consideration the input of my fellow, trusted beer friends and ended up skipping a couple of beers I had intended to try due to poor reviews. I mean, heck, it wasn't like there would be any lack of beers to try. In fact, I knew that it would be surprising if I tried all of the ones that I wanted to on this first visit. Of the 12 beers that crossed my lips my favorite, and one that I ended up getting a full glass of, was The Twerking Elf from Stickmen Brewery & Skewery. This 7.2% ABV Northwest Sour Brown was the second beer that I had and was an excellent example of the style. 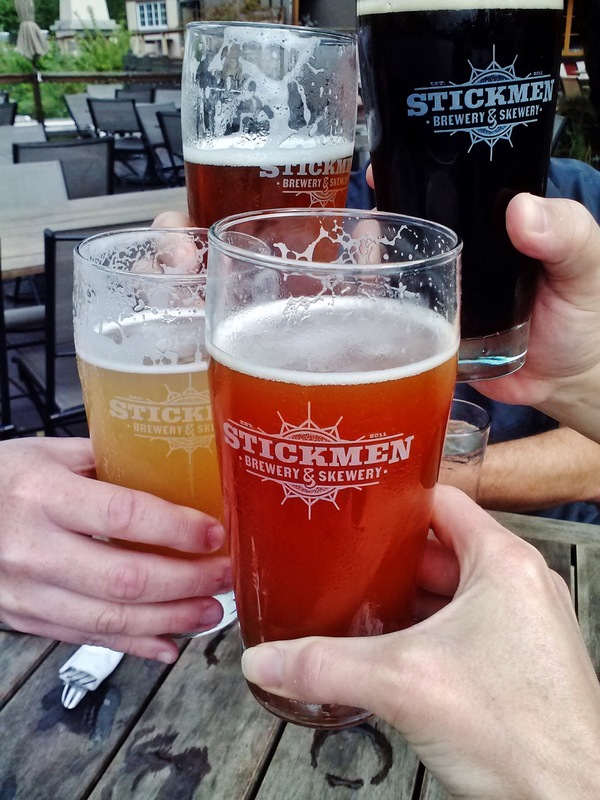 For every person that told me about the Lagunitas, I told them about the Stickmen. - Old Town Brewing Pa Rum Pum Pum Pum, a 7.5% rum barrel aged old ale. I hope that Bolt made more than the amount he sent to HAF because I'd love to have this again, served at a more appropriate, warmer temperature. - Coalition Brewing Shenanigans, a 9.8% barleywine. The same goes for this beer, it was good at the festival but I think it would be even more enjoyable warmed up a bit. - Lagunitas High West Whiskey barrel aged Cappuccino Stout, a 12% stout. My friends were right, the aroma was intoxicating, the flavor even more amazing. Michael hit the nail on the head when he said that it was, "the Velvet Merkin of two years ago." There are still four more days of the festival so there's a fair chance I'll make it back. One beer that will be on my visit #2 list will be McGuinness from Nation Brewery. Mag really enjoyed this 9.2% imperial milk stout that was aged on Kahlua-soaked oak. I'll also be keeping my ears out for what you, my beery friends recommend. 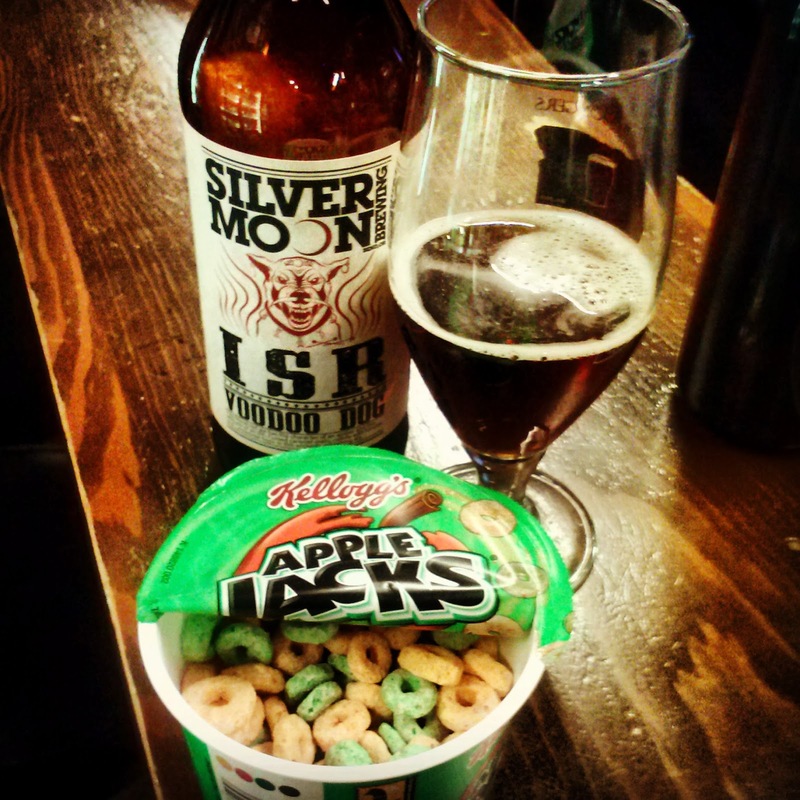 In this final installment of beer and cereal pairings we get to the cereals that I figured would be the most challenging. From what I learned in the first and second rounds I suspected these two would require mild beers, not something that I usually drink. However like many a beer geek, the intrigue of a beer I've never had before often outweighs the known satisfaction of a favorite brew so there was the possibility of finding new beers to enjoy. Silver Moon Voodoo Dog ISR was my first chance beer of the night and when I found it underwhelming I turned to the Apple Jacks. 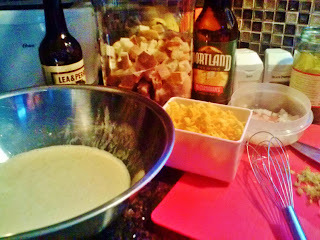 The cereal was sweeter than I remembered but the overpowering sweetness was tempered by the beer. In return, something about the apple-cinnamon flavors in the cereal enhanced the hop profile of the beer, a definite improvement. My next beer selection, Fire Mountain Cold Cold Billy, went similarly although it came as more of a surprise. Deviating from the standard look of most Fire Mountain labels, Cold Cold Billy was billed as a double IPA, something that should be right up my alley. It wasn't. I suspect that it was the variety of hops used that failed to wow me so I looked to the cereal for some assistance. Since the Apple Jacks were already opened I started there and quickly decided it was a solid, "NO." Moving onto the Froot Loops I was pleased to find that the sweet, artificial fruity combination in the cereal managed to sharpen the focus of the beer, pushing whatever flavors were "meh-ing" me to the background, allowing me to enjoy the beer more with the cereal than on its own. The moral of this edition of the story was that two very sugary cereals managed to improve two disappointing beers. 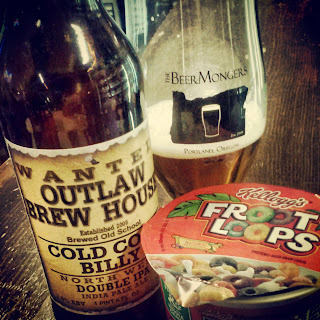 Had I not tried both the Apple Jacks and the Froot Loops with Cold Cold Billy I would have suspected it was merely the sweetness of the cereals that worked. Instead something about the apple-cinnamon flavors worked far better with that beer while the fruit flavors spoke to the other better. Go figure.